THE MAYBELLINE STORY : "It all began with the "eyes." In the book, The Maybelline Story, by Sharrie Williams, she tells the fascinating account of the early beginnings of her family in rural Kentucky, from 1911, to their glory days in Hollywood with Joan Crawford appearing in Maybelline print ads in the late 1940's, to the 1970's as fortune affected the family. "It all began with the "eyes." 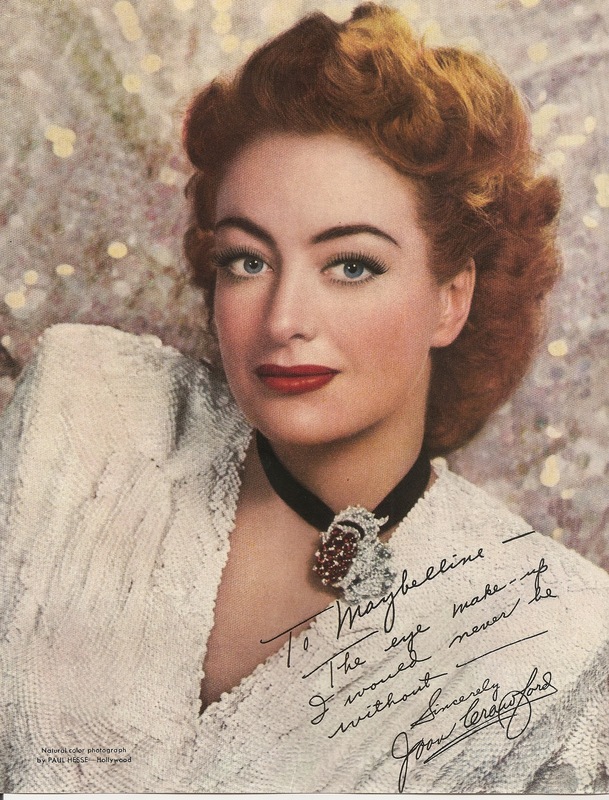 In the book, The Maybelline Story, by Sharrie Williams, she tells the fascinating account of the early beginnings of her family in rural Kentucky, from 1911, to their glory days in Hollywood with Joan Crawford appearing in Maybelline print ads in the late 1940's, to the 1970's as fortune affected the family. Maybelline Mascara Super Model Joan Crawford taken in 1946. Photograped by Paul Hesse, Hollywood. By 1953, the cosmetics company was known throughout the world for their print ads of gorgeous flirty models catching everyone's attention with their Maybelline mascara eyes. Williams' great uncle is Tom Lyle Williams, a marketing genius who built a billion dollar cosmetics empire over many years from just $500. he borrowed from his older brother, Noel. Tom Lyle loved movies. As a fifteen-year-old who ran the projector room at the local nickelodeon, he was mesmerized by starlet Mary Pickford's eyes, as she flirted with them in her movie, Sultan's Garden. What made her so alluring? A very motivated, self-starter, Tom Lyle began finding out ways to make money by figuring out what people wanted. He left the family farm in Morganfield, Kentucky, when he was still just a teenager, to join his brother, Noel, 23, who was working as a bookkeeper for Illinois Central Railroad in Chicago. The year was 1912. Chicago's population was 1.7 million. The brothers lived in Noel's boarding house near a slum of overcrowded tenement buildings. It was in this environment that the brothers, driven by Tom Lyle's passionate courage, began a mail-order business. Tom Lyle sacrificed. He invested every penny he could scrape together. By 1914, at the age of 18, he was making serious money with his novelty-catalog business. In 1915, he had asked his sister, Mabel, to join them. He put her to work counting orders. The business was making $36,500. a year, which is the equivalent of over a half a million dollars today. Tom Lyle's sister insisted on cooking for her brothers. While Mabel was making cake frosting one morning by melting sugar in a pan, the liquid got too hot. Flames shot up and singed Mabel's eyebrows and eyelashes. She looked like a bare-faced mannequin. But, Mabel was not deterred, either. She had been secretly reading movie star magazines. She had read that these starlets, like Gloria Swanson, used a concoction called, "harem secret," to make their eyes beautiful. Mabel mixed ash from cork she burned, with coal dust, and blended this mixture by using petroleum jelly. She dabbed this goo onto her eyebrows and the tips of her eyelashes. The transformation was amazing. Mabel's eyes were stunning. Then, an idea struck Tom Lyle like a bolt of lightening. Of course, it wasn't the clothes or smiles that made Hollywood goddesses glamorous. It was their "eyes." Mascara was born. The name Maybelline came from Mabel and the Vaseline mixture. By the time the 1920's came roaring into Chicago, women had claimed the right to vote, hold hands with men in public, smoke cigarettes, and a whole lot more. They took full advantage of their new-found freedom. 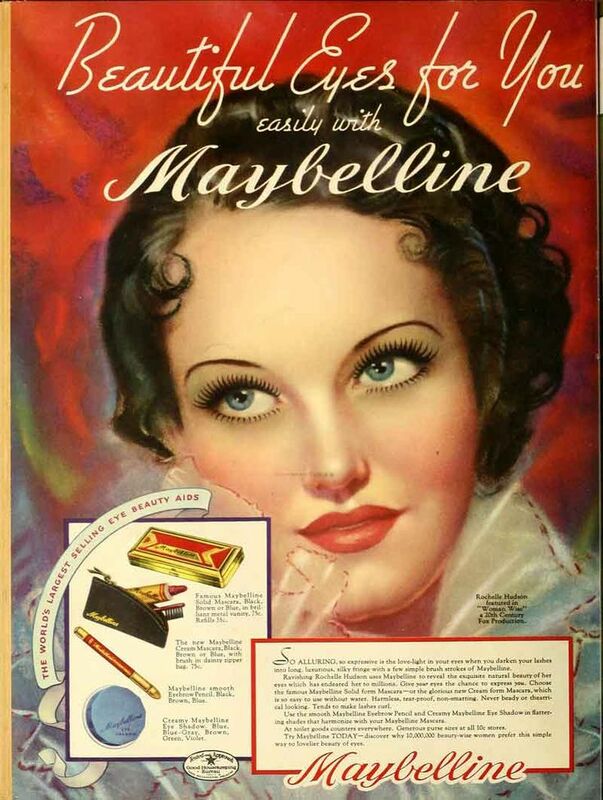 Tom Lyle's entire family was in Chicago at this time, helping in the business of making Maybelline mascara. Tom Lyle's younger brother, Preston, incredibly handsome, a WWI hero, was watching a Memorial Day Parade when he and Evelyn Boecher spotted each other. Evelyn also spotted Tom Lyle. "She fell in love with both brothers on the same day," says Sharrie Williams, of her grandmother, Evelyn Boucher. Evelyn was one of three daughters of John Boucher, a wealthy plumber, who spoiled his girls rotten. Always dressed in fine clothes, refined by music lessons, Evelyn, Bunny and Verona defined elegance. It was Evelyn, however, who became Tom Lyle's muse, and helped catapult Maybelline into the mascara cosmetics market. Sharrie relates in her book, The Maybelline Story: "Destiny arrived right on time, in the form of Evelyn Boucher." Evelyn married Preston, but she continued to be the eyes and ears for Tom Lyle when it came to women and what they wanted. She contributed many ideas for the Maybelline mascara ads that put the company on the map around the world. "Nana had very good insight, " says Sharrie. "She was an observer, a people-watcher. She loved to go to public places. She'd watch what women were wearing, what they talked about, laughed about. She would take it all in, then she would be able to condense this information and tell Tom Lyle. They would have dinner together and she would let him know - this is what women are looking for. This is what they want." One day, Tom Lyle asked Evelyn to pick up some flyers from the printers, that he was going to mail to dime stores around the country. This was the time when Al Capone and other gangsters practically owned Chicago. Drive-by shootings and loud-mouthed gangsters were part of the city's fabric. Clutching an arm-load of flyers, Evelyn was almost to the Maybelline building when a car backfired. Everybody ducked, thinking it was gunshot. Evelyn jumped and threw her arms into the air, releasing the flyers, which were picked up by the wind. An astute newspaper reporter snapped her photo. The next day, the newspaper printed Evelyn's photo with this title: "Miss Maybelline Stops Traffic." Orders for Maybelline mascara came pouring in. As Sharrie recalls, in her book, The Maybelline Story: "My uncle said to Nana: ' Evelyn, with that one photo you've accomplished more for marketing Maybelline than any flyer ever could." Copyright Anne Mount. Contact the author to obtain permission for republication.